We invite you to compare the HEAVY DUTY FEATURES of our American-made bimini tops to any other brand. Many of the "extras" we build into every top are not available through other sources. If you're going to invest your money in a high quality bimini top, we encourage you to "invest" a little of your time to be sure you receive the best top available. The structural integrity of our tops is second-to-none, our bimini top pricing is hard to beat, and we offer Sunbrella Bimini Tops in 71 different colors (each of which comes with a full 10 year warranty)! Not sure if you need a 3 or 4 bow bimini boat top? If you need experienced advice on which top would be best for your boat, just contact us or call toll-free. In most cases our online catalog will have a listing for your particular boat. However, if that fails we can still help you get a custom bimini top by size. 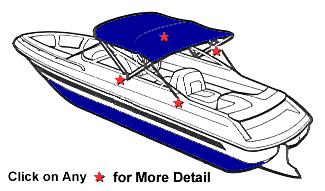 We also have specialty pontoon boat bimini tops and boat tower bimini tops. In addition, we carry a full line of bimini top accessories. needed for quick installation. Plus, you also receive our Cool-Kit.